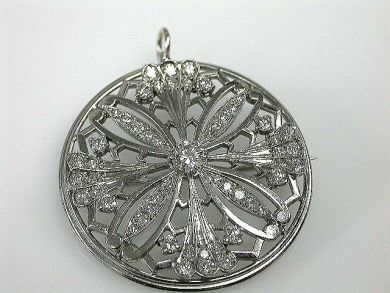 One custom-made platinum diamond circular floral openwork brooch, made by Birks. One round brilliant transition cut diamond (0.26 carats: VS1 clarity: G-H colour). Twenty-four round brilliant transition cut diamonds (0.72 carats: VS clarity: G-H colour). Twenty-eight single cut diamonds (0.38 carats: VS colour: G-H colour).